Ok. This album is not only substantially better than the previous one, but it helps put the previous one in context. Eminem does some interesting things here, his use of three different characters, the insane murderous Eminem, the insane joker Slim Shady and the "constructed" author Marshall Mathers. The Slim Shady tracks are almost immediately ignorable. The Eminem ones are often disturbing, but it is in Marhsall Mathers that more interesting things happen. Eminem reveals himself as revolted against the hypocrisy of middle-America's attitudes to music and as a raging homophobic, but also as a humane songwriter. He is still thoroughly annoying, and this isn't an album that I'd like to listen to again, but the way in which he re-contextualises '97 Bonnie and Clyde in Stan and Kim as well as re-contextualising Stan itself in Who Knew makes the album a less superficial experience that it might at first look. Eminem is a "shock" singer, his whole point is to cause a reaction and in that he is very successful, even if the reaction is to turn off the radio. 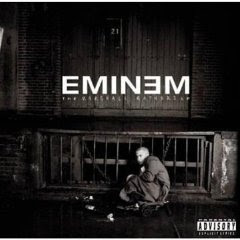 In 2002, French jazz pianist Jacques Loussier filed a $10 million lawsuit against Eminem, claiming the beat for "Kill You" was stolen from his song "Pulsion". He unsuccessfully demanded that all sales of the album be halted and any remaining copies destroyed.